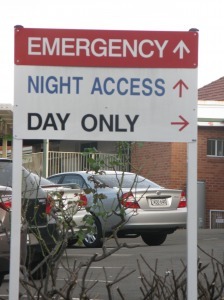 THE Save Bulli ED Group have hit back at claims by Illawarra Shoalhaven Local Health District (ISLHD) Chairman, Professor Denis King, that the community group lobbying for the retention of a 24 hour, seven day a week ED at Bulli Hospital was to blame for causing confusion. Save Bulli ED Group convenor Alison Fettell said the changes ISLHD is trying to implement at Bulli ED are not manageable and it is blaming the community. Professor King stated in the Illawarra Mercury on Saturday that “the word emergency in the name of the centre has created confusion and distress in the community”. Ms Fettell said Professor King had got it wrong and what had created distress in the community is the removal of a 24/7 essential health service. “That was your decision, NOT the community’s,” she said. “The Save Bulli ED Group support peaceful forms of protest against what we see as life threatening decisions regarding the removal of essential health services in our region. The group have launched a petition regarding the downgrade of the Bulli ED on ‘change.org’. “This issue is not going away, if anything it will escalate until the 24/7 emergency service is reinstated”, ms Fettell said.